We are immersed in a culture of spoken media, written media, and – like it or not – screen media. Just as writing and speaking skills are keys to functioning in society, we must consider that the future increasingly demands proficiency in “mediating” as well. Doing anything less leaves this powerful medium in the hands of a relative few. By offering instruction in what screen media is, how it is created, how it relates to other literacies, how the internet is changing it, and how this all informs everyday teaching and learning, the Rosebud Institute seeks to make screen media literacy more broadly understood and accessible. 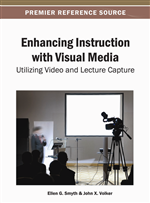 This chapter follows a program developed by the Rosebud Institute and looks at how – using simple, accessible technology – people can become more screen media literate by creating digital films and ePortfolios themselves. Developed along with Rosebud’s program manager, Christine Wells, the creation process enables deeper, more authentic learning, allowing us all to communicate more effectively, to self assess more reflectively, and to thrive in a screen-based world. Have you looked at a screen today? You may of course be reading this text on paper, but chances are growing ever stronger that you may well be looking at a screen right now as you read this chapter. In many cases, it seems not that big of a deal. After all, it is simply words on a page and the medium of delivery may not be all that crucial. Inverting the classic phrase of communication scholar Marshall McLuhan for a moment, the medium does not really seem to alter or affect the message all that much in this particular case. Or does it? With the tectonic media shift in which we find ourselves, the lines we think we know, and think we can count on, seem to be blurring. The myriad machinations and goings on in our convergent media world, while a fascinating and rich topic, understandably extend beyond the scope of this chapter. Rather the focus here is to look more at what we can do now. Now that the explosive growth and pervasive penetration of new media is upon us, what can we do to get a firmer grip on the reins? How can we go beyond handing out expensive devices designed to simply access the conversation, and instead convey real skills that allow more people to effectively join in, to make clear meaning, and to affect the change they seek? One way is to take a step back – get back to basics a bit and begin to give people some simple tools that they can use to more effectively be a part of the burgeoning world of what is happening on screens around the world. As mentioned, you may be looking at a screen right now but if not, you have probably looked at one if not several already today and most certainly – unless you make a concerted effort to the contrary – you will be bombarded with screen images all day, telling you what to do, what to think, what to like – even what to say. This ever-expanding world of screen-based electronic media encompasses such an understandably and incredibly broad array of media types, paradigms, and histories that even finding a name or term to refer to it all can prove difficult. For our purposes here, we prefer the term screen media. It is a term we are becoming more and more comfortable with to specifically describe media produced, created for, and unfolding on the screen yet it is general enough to encompass a broad array of different media, both moving (film, video, television, and gaming) as well as those which are generally more static (websites, social media, blogs). As mentioned, this chapter has a necessarily refined scope. We will look at a very practical and doable approach to giving people a baseline way to become more active and informed members of a screen media world. Interestingly, it is in this more simple approach that the potential becomes highly expansive, giving people the tools to literally go wherever they want, much like the effect of teaching a person to write or to read. But what people or persons are we talking about? Who is this for? To say everyone may well elicit a raised eyebrow or two but literally, screen media literacy is so crucial that virtually everyone will need some baseline understanding of what it is and how it works. This is not a new concept of course. The term media literacy has been around since the 1970’s and in 1988, one of the most relevant and enduring quotes comes from a former president of the Carnegie Foundation for the Advancement of Teaching, Ernest Boyer: “It is no longer enough to simply read and write. Students must also become literate in the understanding of visual images” (Boyer, 1988). What is new however, is how far-reaching and therefore undeniable the screen has become. If screen media is virtually everywhere, then its literacy is in demand virtually everywhere if we are to have an informed and literate public. “The ability to both read and write visual information; the ability to learn visually; to think and solve problems in the visual domain—will, as the information revolution evolves, become a requirement for success in business and in life.” (Gray, 2008) That said, keeping our sites on achievable goals and not biting off more than is manageable, the immediate audience addressed mostly herein are students and educators – both in a K-12 environment and in post-secondary education as well.